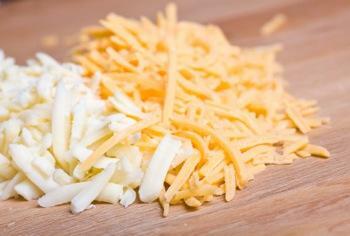 A box grater will make quick work of cheese. A Microplane box grater is a handy addition to your gourmet cookware and accessories. This multi-tasking tool will have you grating all sorts of foods with ease. In addition to function, these box graters are designed to have great form as well, making them impressive to look at and fun to use. What Is a Microplane Box Grater? All Microplane graters are made from surgical grade stainless steel, which shaves down a variety of foods with ease and precision. Microplane tools are covered with hundreds of small, razor sharp edges that make quick work of fruits, vegetables, cheeses, and more. Instead of the everyday stamped blades that regular box graters are equipped with, these photo-etched blades are super sharp and built to last. The elite box grater features a rugged plastic construction that makes it more durable than most graters. With a rust proof body and solid handle, this grater is built to last. Equipped with five planes of razor-sharp blades, you have the option to achieve a fine, coarse, ribbon or ultra coarse grate, and there's also a slicer blade option. There's also a clear measurement panel so you can see how many cups you've grated. The four sided box grater allows you even more options than its two-sided counterpart. It includes a slicer, medium edge, coarse edge, and removable zester. Voted "Best Overall Box Grater" by Fine Cooking Magazine, this versatile kitchen implements does it all and looks good doing it.Complete with a plastic storage guard to protect the blades when the grater's not in use, this tool will replace almost all of your other grating and slicing tools. A solid plastic body and rubber feet make this box grater feel like a workhorse, and it'll provide you scalpel-sharp slices for years to come.